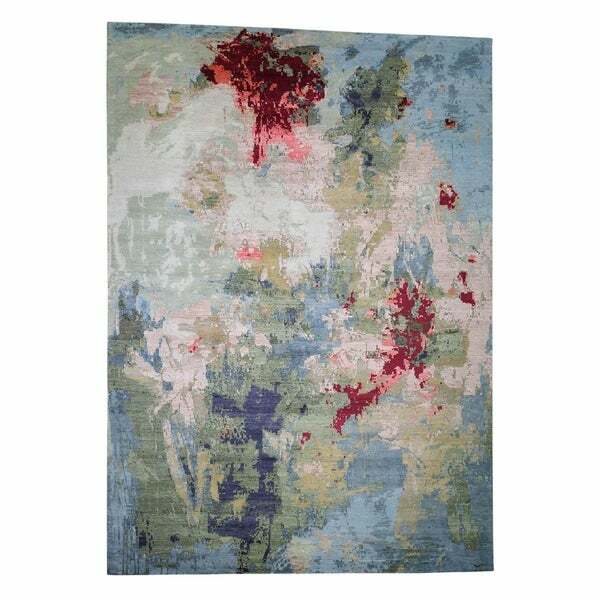 Shahbanu Rugs Wool And Silk Abstract Design Hi And Lo Pile Rug Hand-Knotted Rug (10'0" x 14'2") - 10'0" x 14'2"
Shahbanu Rugs Hand-Knotted Hi And Lo Pile Wool And Silk Abstract Rug (8'1" x 10'0") - 8'1" x 10'0"
Shahbanu Rugs Wool And Silk Hi And Lo Pile Abstract Design Hand-Knotted Oriental Rug (9'0" x 12'0") - 9'0" x 12'0"
Shahbanu Rugs Abstract Design Hi And Low Pile Hand-Knotted Wool And Silk Rug (6'3" x 8'9") - 6'3" x 8'9"
Shahbanu Rugs Tone On Tone Damask Design Wool and Silk Hand-Knotted Oriental Rug (10'0" x 14'2") - 10'0" x 14'2"
This is a truly genuine one-of-a-kind Hand-Knotted Wool And Silk Hi And Lo Pile Abstract Design Rug. It has been knotted for months and months in the centuries-old Persian weaving craftsmanship techniques by expert artisans. Shahbanu Rugs Abstract Design Wool and Silk Hi-Lo Pile Hand-Knotted Oriental Rug (10'0" x 13'8") - 10'0" x 13'8"
Shahbanu Rugs Abstract Design Wool And Silk Hand-Knotted Hi-Lo Pile Rug (5'5" x 7'9") - 5'5" x 7'9"
Shahbanu Rugs Hand-Knotted Hi and Low Pile Wool And Silk Abstract Design Rug (2'0" x 3'0") - 2'0" x 3'0"
Shahbanu Rugs Hand-Knotted Abstract Design Wool And Silk Hi And Low Pile Rug (8'0" x 9'10") - 8'0" x 9'10"